Aurelia gives you everything you want out of a bomb, and for just 4 mana. First of all, her triggered ability happens right away, so you’re getting +2/+0 and some keywords. Secondly, she’s a 2/5 flyer for 4, which happens to be very appealing stats. 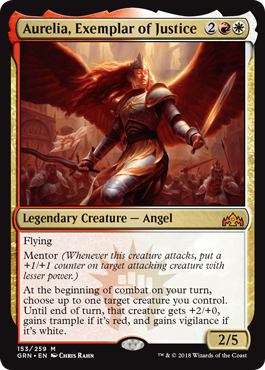 Lastly, she has mentor, which means that she generates value every time she swings. Note that she can target herself with her trigger, making her a 4/5 flyer with vigilance, which is perfect for any mentoring you are looking for. I can’t think of a better exemplar of a bomb than Aurelia.